Connect to multiple iPods, on your local machine or across the network. Drag and Drop Songs/Playlists and Video effortlessly between them. Until now this hasn't been possible without losing all your existing songs. iPod 2 iPod gives you the power to take control of your music collection. The way you view your music is up to you, sort by Artist, Genre, Album, or even group similar songs together, then drag and drop them onto another iPod. 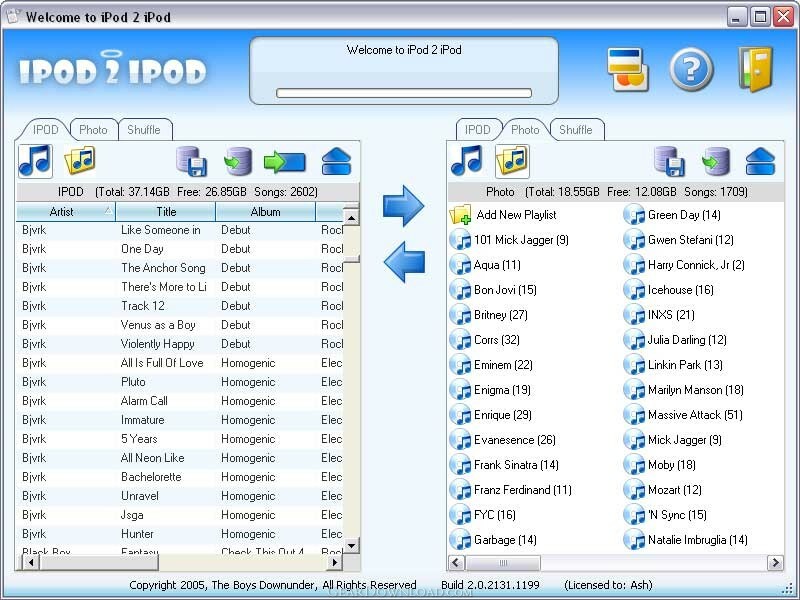 It is easy to end up having duplicate songs on your iPod, the iPod 2 iPod tracks these duplications and allows you to remove them in seconds. It also optimizes iPod storage space allowing you to store more songs. This download (ipod2ipod.msi) was tested thoroughly and was found 100% clean. Click "Report Spyware" link on the top if you found this software contains any form of malware, including but not limited to: spyware, viruses, trojans and backdoors. Virtual iPod - Have you backed up your iPod today? DONT PANIC! iPod 2 PC - Need to transfer music and video between an iPod/iPhone/Touch and your PC?